Sintered and screen wicks both have relatively small pores, with a high pumping capability and a low permeability. This limits the maximum heat pipe length due to the high pressure drop. Arterial and annular wicks are sometimes used to improve heat pipe performance; see Figure 1. The designs all provide a high permeability path for liquid flow, while maintaining the smaller pore size (and pumping capability) of the screen or sintered wick. Figure 1. Different arterial and annular heat pipe wicks. In the tunnel artery shown in Figure 1a, the condensed liquid travels circumferentially in the condenser to artery, and travels down the artery to the evaporator. The liquid then flows circumferentially around evaporator, and is vaporized by the heat input into the evaporator. Similarly, the annular and crescent wicks shown in Figure 1b and c provide a high permeability path for the liquid in screen wicks. In all of these cases, care is taken during heat pipe fabrication to ensure that the arterial space is filled with liquid and not vapor. A major potential problem in arterial wicks is depriming. If a portion of the artery fills with vapor, then the artery stops working, and the performance drops back to the performance of the non-arterial wick. This can happen when the heat flux is high enough. Arterial Wicks are primarily used in alkali metal heat pipes. The alkali metal tends to remove oxides from the surfaces, quenching any nucleation sites. Very high superheats (100’s of °C) are then required to initiate boiling. With other working fluids, the risk of depriming the artery is much higher. 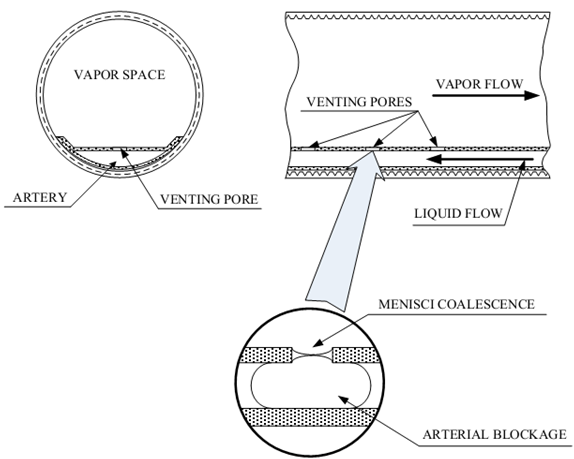 One method of improving the reliability of arterial heat pipes is to use a self-venting wick, as shown in Figure 2. A self-venting wick has a series of small holes in the evaporator section of the artery. These holes allow vapor or non-condensable gas to vent into the vapor space, allowing the artery to reprime. The drawback is that the effective pore size is the size of the holes, and not the screen pore size. Another drawback is that they are significantly more expensive to fabricate. Figure 2. A self-venting arterial heat pipe has small vents in the evaporator to allow the artery to refill with liquid after it is drained.